We learn from the past and how it affects the present and the influence we live in the future in this degree. We mortals strive to endure, produce and improve the world as it surrounds us. There is no apron, but the jewel is a gold "parallelogram" (rectangle) with a Greek Alpha on one side and an Omega on the other. The lessons to be learned from this degree are that arrogance; defamation and cowardice are unworthy attributes of a Mason and that humility, modesty and courtesy are the true virtues of men and Masons. The apron worn is yellow and contains an arm holding a sword, a winged figure holding a key in the left hand and the right forefinger on the lips (the "Egyptian figure of Silence"). The jewel can be described as a point-up triangle, with an arrow, point downward, an arm holding a sword, and the motto "Fiat Justitia, Ruat Coelum." This degree teaches the apprentice to scorn selfishness, and to uphold the knightly virtues of charity, truth and honor. We should always strive to assist the poor, helpless and infirm. 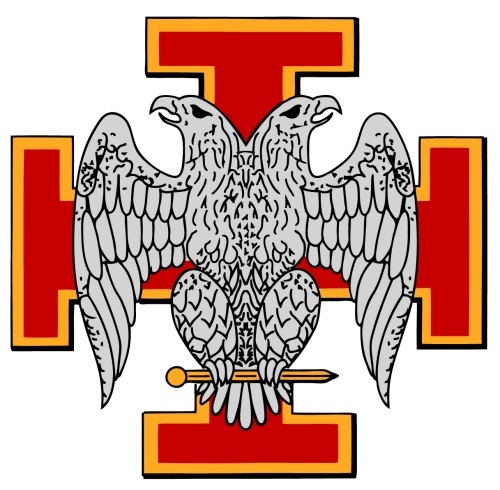 The apron is a scarlet lambskin, lined in black, with a Teutonic Cross (cross potent sable, charged with a smaller cross double potent or, surcharged with the escutcheon of the Empire - the two-headed black eagle) and a black key surrounded by a laurel wreath. The jewel is the Teutonic Cross shown on the apron.